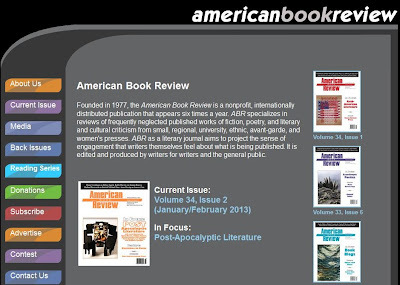 The new issue of American Book Review is alive and well with reviews of Blake Butler's Scorch Atlas, Colson Whitehead's Zone One, Pamela Ryder's A Tendency to Be Gone, and many more. I take a look at Patrick Michael Finn's From the Darkness Right Under Our Feet. Thanks to ABR & Tom Williams.